Taking to the stage in a cold blue light The Dandy Warhols emerged to a drone of far out feedback before their lulling vibrations slowly morphed into 1997’s Come Down opener Be In. 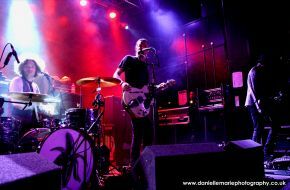 Manchester’s Academy 2 was packed with an eclectic audience ranging from a 'Class of '95 reunion', to the generic Topshop dropouts. Reeling off We Used To Be Friends and Not If You Were The Last Junkie On Earth, we’re looking at a set peppered with the hooky retro hits they have made their name with for 18 years. But something is awry, its sounding pretty damn coarse and by the sixth song in, the strained sound coming from the stage and booming around the cavernous Academy 2 seems more akin to a DIY punk show rather than the sleek psych pop the Dandys are best known for. Whether this element is responsible for the rather docile apathy ambling through the crowd is anyones guess, Zia asks at one point “Is it Friday?”, indeed, the majority have a jaded Sunday morning quality to them. Thankfully about ten songs in, they turned a corner with Ride from 1995’s Dandys Rule LP being a noticeable change in sound and spirit and the band united with their audience. Bohemian Like You gets the iphones in the air with eye rolling expectancy, but the summit of the show is the haunting Godless that floats through the venue with ethereal beauty as Peter Holmstrom nonchalantly evokes otherworldly resonance. Boys Better closes the evening and although one feels like having ingested a handful of Valium, (not the best physiological state to be in on a Friday night in Manchester) The Dandys undeniably still know how to put a setlist together, even if they’re not quite sure how to do it on record anymore.